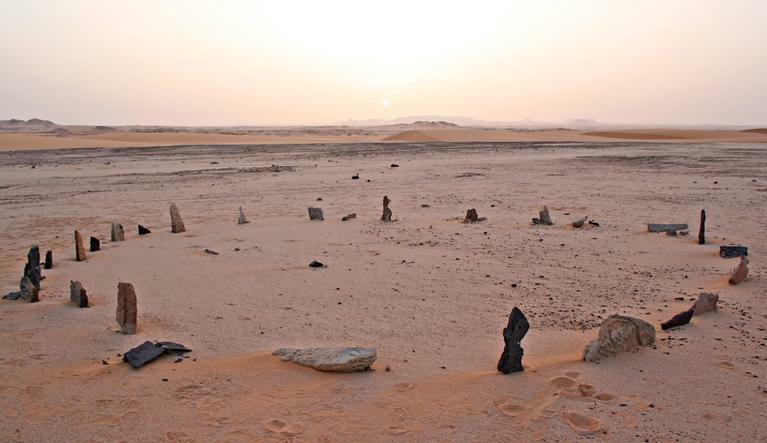 On the northeastern side of the remote Gilf Kebir plateau lies a mysterious prehistoric stone circle, found in October 1930 by British Army major and seminal deep desert exploration pioneer Ralph Bagnold. 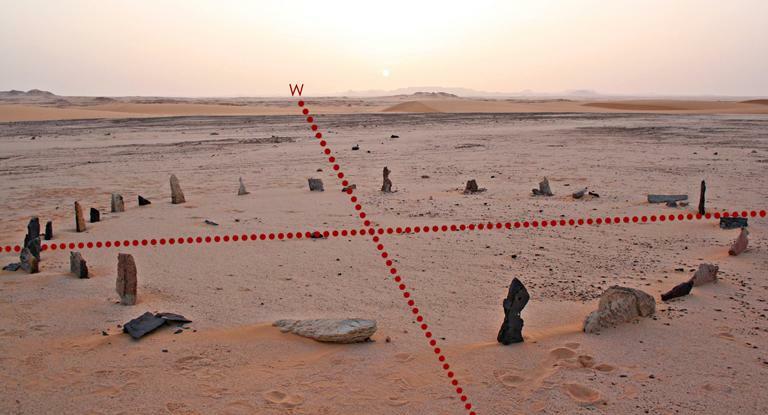 After the Nabta Playa stone circle, "Bagnold's Circle" is the most significant construction of its type known in the Egyptian Sahara. Its provenance and construction date are unknown. In his "Journeys in the Libyan Desert" , Bagnold reported on its discovery: "In a small basin in the hills we came next day upon a circle twenty-seven feet in diameter of thin slabs of sandstone, eighteen to twenty-four inches high. Half were lying prone, but the rest were still standing vertical in the sand." I first visited the site in April 2008 (R. Bauval - M. Marai Expedition), and we spent a full day, night and morning exploring the location and its immediate surroundings. Brophy, Bauval and Marai provide scale at the 27-foot diameter prehistoric construction. D. Donaldson kneeling at the western gate of the stone circle while other expedition participants measure and discuss, 2008. Continuing on, Bagnold notes: "There was no doorway or other sign of orientation, and though we searched within and without the circle, no implements could be found . . ."
This latter observation of an absence of implements—corroborated in 2001 —is contrary to what my companions and I found in April 2008. 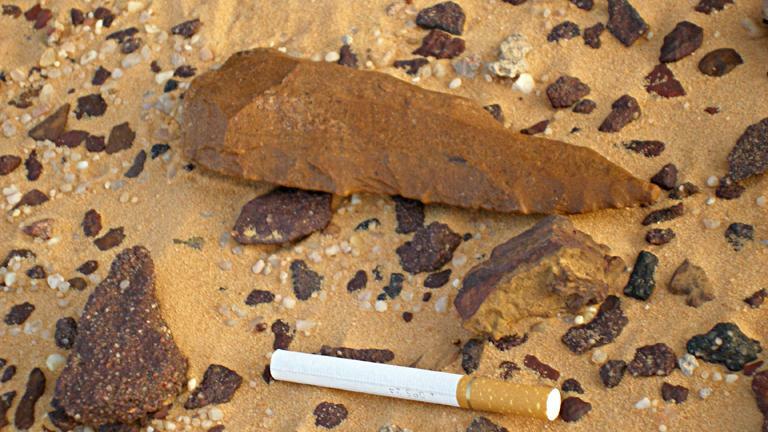 In several areas nearby, especially on the Northwestern side, we found a large quantity of high-quality implements and tools such as arrowheads, grinding stones and plates, a flawless black diorite axe-head, and a peculiarly worked, perfectly oval stone. On a return trip—coincidentally almost exactly 82 years to the day of its discovery by Bagnold! (D. Donaldson - M.Marai 'Decoded' Expedition, October 30, 2012)—the implements were now almost completely non-existent. This development greatly surprised us, and we were ultimately led to the conclusion that treasure hunters had scooped up the artifacts at some point between 2008 and 2012. A small selection of the many high quality tools found in April 2008. It is quite significant that black diorite and red granite are the preferred stones of choice among the highest-level Ancient Egyptian stonemasons in temple-building, statuary, etc. So, what is the purpose of this enigmatic construction from before recorded time? As is the case with the majority of stone circles found worldwide, it is most fundamentally an astronomical tool. 1. The amount of stones. There are 27-29 stones (depending on how one counts them. It is difficult to tell if a couple of the stones are split in two from decay, or if they are discrete, and intended to stand alone). For those aware of such a connection, these numbers immediately suggest a lunar-astronomical function. Also, note again that the circle is 27 feet in diameter. This is very interesting, as I will show in my forthcoming work Tau Eden: The Universal Key in the Cave Of The Shining Ones that the builders of this stone circle were likely using what we know as the 'English' inch and foot for their measurements. 2. The select placement of certain stones at cardinal points—i.e. 'doorways and orientation'—within the arrangement. 3. The physical location of the circle itself. During the 2008 expedition, we quickly ascertained the likely significance between the structure and the latitude at which it is found. "As we approached Bagnold Circle, we were keenly aware that no studies of its possible astronomical alignments had ever been conducted. As Wendorf, Schild and Malville wrote in 2008, “. . . a well-known stone circle was discovered by Bagnold (1931 [sic]) in the Libyan Desert . . . . No evidence of astronomical orientations had been reported, and none is readily discernable in photographs of the circle.” Because of its incredible remoteness, few people have actually seen Bagnold Circle, let alone studied it in detail on location ..."
The physical features we noted first were two prominent, upright, and elongated stones (very reminiscent of the gate stones of the Calendar Circle at Nabta Playa) that defined an east–west alignment. One of these stones on the west side was white, and the stone on the eastern side was black, which may indicate a symbolic significance of some sort … [with] our GPS we took readings of this alignment as well as readings for the north–south alignment, which also had at each end a very dark-colored stone, nearly black, and a very light-colored stone, nearly white. The two alignments—east–west and north–south—strongly imply an astronomical function for the Bagnold Circle. Another clue are twenty-eight stones that form the circumference of the circle, which is not only implicit of the lunar phase cycle of 29.5 days but, more important for us, also brought to our attention a clear connection to the Calendar Circle at Nabta Playa, which also had twenty-eight stones around its circumference. We also noted that north of the circle there was an elongated low hill that suggests observation of the low northern sky, possibly for marking the passage of a circumpolar constellation or star. In my view, the stones of "Bagnold's Stone Circle" show clear signs of water erosion, as they do not exhibit the smooth, uniform sand-polish that wind recognizably imparts. Recent studies confirm that this area was subject to seasonal monsoon rains in the 'Green Sahara' period, and indeed was the Southwestern edge of an enormous lake in Holocene times . One even wonders if large amounts of water and rivers still remained in the area up to the neolithic period. Were the stones lapped by waves, submerged, or simply weakened through endless push-pull cycles resulting from nearby moisture and sun-baking effects? The presence of significant amounts of water on and in the ground at the circle would also go a long way in explaining why some stones have fallen. To my knowledge, no geologist has ever visited the site however, so if and until that time we must be content with such speculation. 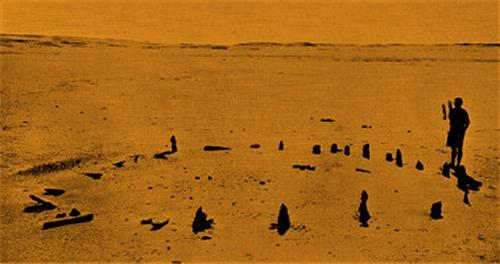 D. Donaldson viewing the western horizon with binoculars across the decayed E/W gate of Bagnold's Stone Circle, 2012. Note the difference in the physical state of the stones that comprise the circle, as compared with the stones outside of the circle (previous photo). The circle stones seem to be eroded by an alternating moisture/heat process, hence their 'crumbling' appearance. 3. Robert Bauval and Thomas Brophy, Black Genesis, Bear and Co., 2011. All content © 2008-2019, Donaldson/Iwata for The Source In The Sahara and Mesmer Detector, Ltd, except where noted. Photographs by Dustin T. Donaldson, Robynn Iwata and Mohamed Fayez Marai, 2008-2012. Media and website/blog photo use permitted ONLY if credited to www.TheSourceInTheSahara.com.